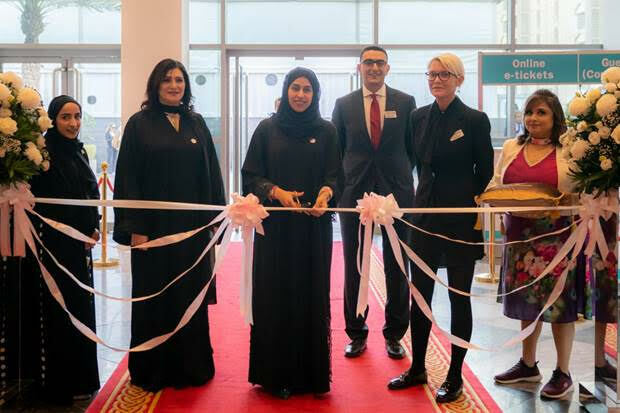 Her Excellency Minister Hessa bint Essa Buhumaid, Minister of Community Development inaugurated BRIDE Dubai 2019, the four-day largest wedding and lifestyle event in the Middle East, held at Dubai World Trade Centre (DWTC) until February 9. The opening was attended by Vice President of Informa’s Consumer Division Suzy Pallett, Informa’s Head of Protocol Manal Younes, and BRIDE Head of Marketing Sarita Lakhiani – as well as a large number of brides and brides-to-be. Day 1 exceeded the highest expectations as visitors embraced the latest bridal trends, affordable high-end fashion, stunning jewellery, and influencer meet-and-greets, on top of a host of discounts on the latest hair, beauty and wellness innovations. The ministry’s participation comes as part of the national policy to empower the people of determination which was declared by His Highness Sheikh Mohammed Bin Rashid Al Maktoum, Vice President, UAE Prime Minister and Ruler of Dubai. Spectators gathered in huge numbers at the Main Stage in the Magical Secret Garden for an enchanting schedule of breathtaking catwalk shows, from Sevda Fashion House and Ritu Kumar, along with the exclusive BRIDE Fashion Show. Visitors were also treated to a host of fantastic demonstrations, tips, trends and comprehensive guides from Tips & Toes, Savoir Flair, Emirates Specialty Hospital and Canadian Medical Centre, as well as sensational entertainment with Riya Berry Choreography. Popular influencers Dana Al Tuwarish and Latifa Al Shamsi were also on hand to meet and greet the delighted fans, while offering their top tips and expertise. There’s even more to look forward to over the next three days of BRIDE Dubai 2019, with an amazing line-up of magical fashion shows, featuring exquisite collections by Piero Camello, Apple Wang, Garimon Roferos Couture, Sevda Fashion House, Noorkhanjar Artwork, Atelier Zuhra, and Amato Luxe By Furne One. Additionally, Tips & Toes, Savoir Flair, Emirates Specialty Hospital, and Canadian Medical Centre will return with more educational, entertaining and enriching demonstrations, tips, trends and comprehensive guides. Riya Berry Choreography will get visitors moving and grooving, while Qomrah Studio will present the ultimate guide to help brides-to-be capture ‘A Moment That Lasts A Lifetime’. Luxury lifestyle influencer, fashionistas and style icons Fatma Husam, Noha Nabil, and Al Reem Saif, will also be meeting and greeting fans over the coming days to impart their in-depth knowledge and invaluable advice. To top off an action-packed 4 days, the BRIDE Dubai 2019 Wedding Awards will take place on Saturday, 9th February. For the full schedule.